The prime minister had a lot to say about diversity Thursday after he was asked to respond to criticism over the lack of interesting architecture projects to mark Canada's 150th anniversary. 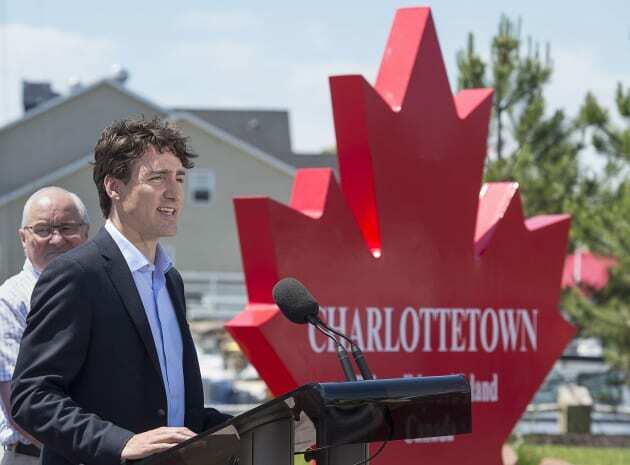 Prime Minister Justin Trudeau was in Charlottetown, P.E.I. Thursday for a meeting with the province's premier when he was asked to address an editorial in Canadian Architect, criticizing Canada 150 infrastructure projects as a "far cry" from modernist art centres built 50 years ago. Trudeau deflected, somewhat, and focused on Canadians. Prime Minister Justin Trudeau talks with reporters as he visits Charlottetown on June 29, 2017. "Our greatest strengths are not in bricks and mortar or even in the land, but in the people who share these communities who want to build a vibrant future together," he said. His full response touched on diversity, the middle class, and sneaking in a plug about the economic benefit of energy projects. When I think about the legacy of Canada. I think of the communities we build. I think of the people who come together and celebrate, understanding that diversity is a source of strength. I respect that people will be looking for different things to mark this milestone, but I always focus on Canadians; on the stories we tell each other of where we've been and where we're going as a country; on recognizing that our greatest strengths are not in bricks and mortar or even in the land, but in the people who share these communities who want to build a vibrant future together. Our government makes no apologies for the investments we made in Canadians themselves. In putting more money in the pockets of the middle class and making sure there are opportunities to celebrate as families, as communities right across the country. In terms of legacy, the historic investments we're making, in transportation infrastructure, in social infrastructure like the two seniors residences we've announced here on the island, working closely with Wade McLaughlin to make sure that the social infrastructure funding is flowing. Energy projects that are gonna continue to connect and contribute to the economic growth of our communities. We are focused on the things that are gonna make a difference in the lives of Canadians while at the same time we celebrate the things that make us dream. I'm incredibly proud of how we're coming together for Canada 150, we're gonna continue to celebrate every day as we think every day about what more we can do to create stronger, more resilient communities that understand that our diversity is the greatest source of strength that we have.